It can be extremely difficult keeping your large dog, that has loads of energy, happily contained. Larger breeds love to jump, climb and are not looking to stay restrained in the backyard. If you have a big dog like that, it is important that you take a few things into consideration before choosing the type of fence to add to your yard. Here are three things to consider when selecting your ideal furry friend fence. Shorter fences are not likely to keep your bigger dogs contained. Dogs are strong creatures. Be sure that you use high quality materials and that it’s properly installed. Not only does your fence need to be strong, but it needs to be tall, as well. You should consider purchasing at least a five or six foot fence. Huskies, Great Danes, English Mastiffs and even Labradors require higher fences like that. Some dog owner “fix” the problem by adding height extensions to the existing fence, making it taller and taller. This only teaches your dog to jump higher, so your best bet is to tear down the old fence and install a taller fence. While your dog doesn’t need privacy, s/he certainly doesn’t need to see what’s on the other side. Chain link fences will only drive your dog nuts by teasing and taunting him with what they are missing and what they cannot have. Solid panel fences are private and are a lot more aesthetically pleasing. They will also block your pup’s view of people, other dogs and small chase-able creatures which can eliminate excess barking and escape attempts. A happier dog means happier neighbors and by-passers which means a happier owner. You know your dog best of all. You know her behaviors, temperament, and triggers. So take a little time before selecting your fence to consider what is necessary and what will be best for your pooch. The first step in stopping your escapee is knowing how they are getting out. Are they digging, climbing, or are they jumping? If they’re digging, you may consider lining the surrounding ground with chain-link fence or chicken wire. The barrier is frustrating to dogs and they’ll give up digging eventually. If your pup is a leaper, you may want to consider installing some sort of barrier atop your fence. If they are climbers, you will definitely want to make sure the fence is climb-proof. Chain link fences are easy climbed by humans and dogs! Solid panel fences, however, have a flat, slippery surface. This makes climbing much more difficult for climbers; humans and dogs alike. Climbers and jumpers are smart and resourceful. So make sure you don’t have any boosters like chairs, planters or anything else your dog can climb onto near your fence. Call Outback Fencing today for all of your fencing needs. We’re happy to help determine what type of fencing will surely keep your favorite four-legged friend in and keep the unwanted out. A fence is an important part of your yard and home. It keeps your land secure, gives your home privacy and, with continued care, it can give your space some great curb appeal. To protect this investment and keep it in good condition, proper care, maintenance, and attention are required. By staining or painting your fence, you can protect your fence from bugs, rot, and can lengthen its life. How Often Should You Paint or Stain Your Fence? Keeping your fence properly stained or painted protects it from moisture, the sun’s harmful rays, and insects and bugs. A barrier, like a paint or a stain, is necessary for protecting your fence from these damaging elements. These elements are what determine how often your fence should be stained or painted. Fence experts say painting or sealing every two to three years should be enough. However, if you live in a rainy area, a sunny desert with little shade or the fence often gets wet because of sprinklers you may need to paint/stain your fence more often. If your painted fence has cracks, chips or signs of wear, it is time to repaint your fence. If water sitting on your stained and sealed fence no longer beads up on the fences’ surface and is now soaking into the fence, it’s time to re-stain and seal it. Some people prefer stain over paint and others swear by painting. It really is a matter of preference. Both create a barrier and protect it from weather, critters and normal wear and tear. Depending on the quality of paint you choose, painting your fence may be less expensive. However, if you paint, you may need to repaint more often depending on the weather in your area. Also, keep in mind, you will need to sand the old paint off before you can repaint your fence. Choosing to stain your fence may feel like the more expensive route, however, keep in mind, it’s an investment. Depending on the external elements, staining is a less frequent job than painting. When it comes time to do the job again, you don’t need to sand off the old stain, as it just fades over time. Check the weather! Make sure the weather is forecasted to be dry and between 50 and 80 degrees Fahrenheit. Avoid painting or staining your fence when precipitation is in the near future, as it needs time to dry thoroughly. Also, avoid windy days to prevent dirt, sticks, and other debris from adhering to your freshly painted/stained fence. Determine what materials you already have and what you still need. It’s a pain to have to leave mid-project to grab another bucket of paint. Hire a friend. Many hands make light work and a good time! Make sure your paint/stain is good quality. Make sure you like how it fades/ages. Prep the area and make any repairs necessary before the painting party begins. Always use protective gear for yourself and anyone else participating. Keeping your fence clean is an essential part of fence maintenance. A clean fence will not only help look better, but it will prolong its lifespan, too. Thankfully, cleaning fences is quite easy and can be completed with things you may already have in your cupboards or with a quick trip to your local hardware store. Follow these tips for cleaning your vinyl, wooden, or metal fences. One thing to keep in mind, no matter the material your fence is made of, if you plan to use a chemical cleaner, be sure to cover the ground and plants around the fence with plastic to prevent damage to the surrounding area. To protect your wooden fence from the elements and to keep it from cracking, cupping, or warping, you must keep your fence clean and sealed or stained. Start by putting your safety glasses and gloves on. Once in place, mix a mild detergent solution. Many people like Oxiclean or bleach, others prefer vinegar. Scrub your fence with a fiber scrub brush or, for heavier debris, use a wire brush. Be sure your brushing strokes go with the grain of the wood. Be cautious not to scratch your natural or painted fence by using a light hand. Others opt for a pressure washer. Power washers are just that, powerful! Just be careful to use a washer that is rated at 2,700 PSI or less, use a wide angle tip, spray 18-24” away from the fence, and keep the wand moving at all times. Failing to do so could warp, dent, or take the paint off your fence. Make sure to rinse the wood of any cleansers. Add a sealant or stain once dry, if necessary. Vinyl fences will look dirty faster because of their bright color. Thankfully, however, cleaning vinyl fences is very easy, inexpensive, and will only take a little bit of time. Routinely maintaining and cleaning your vinyl fence will help it from becoming spotted with mildew and mold and keep it from greying with dirt. Steer clear of products that contain bleach, as that could stain your vinyl fence. Instead, use a sodium-bicarbonate-based cleanser. Vinegar is a great cleanser for vinyl fencing, too. Depending on how much dirt and mildew build up there is, you’ll use 1-2 cups of vinegar for every gallon of water. Put on your gloves and dip a knotty terry cloth rag into your solution and start wiping/scrubbing. Use a rag rather than a brush to avoid scratching the surface of your fence. A pressure washer may also be used. Cleaning your metal fence is important in avoid rust spot and dirt. Regular cleaning and maintenance will stretch the lifespan of your fence immensely. Depending on how dirty your fence is, wire brushes can be used to get rid of dirt, rust, old paint, and caked on dirt. If you think a wire brush isn’t necessary you can use a soft bristled brush and some dish detergent. Be sure to rinse any residual suds away. A pressure washer may also be used. Wood fences are chosen over iron, aluminum, or vinyl because of how aesthetically pleasing to the eye it is. However, not all wood fences are created equally. There are many things to consider when choosing a type of wood for your fencing material. Things such as appearance, durability, required maintenance, and rot resistance all need to be considered when selecting a type of wood for your fence. We’ve whittled our list down to three types of wood for that we recommend for your fence. Cedar is a beautiful wood and is a good option for those with a limited budget. Cedar is a great choice because it deters insects and bugs because of the natural oils it contains. Its lifespan is typically longer (especially when comparing to other types of wood) because it is rot resistant. Adding a coat of paint or stain will prevent the wood from turing a grey color and adds years to the life of the fence. Using an acrylic paint will best protect it from the elements. Many people choose to stain their cedar wood fence over painting it, because cedar wood is naturally so beautiful. The wood must be clean and somewhat smooth and will require several thin coats before you can effectively stain your fence. There are stains available that are made specifically for cedar wood. For additional protection against the elements, consider using a sealant. This will help repel moisture and will help block UV rays from the sun that will lead to discoloration. Multiple coats are required for an effective seal. Remember to let each layer thoroughly dry before adding another coat. Like cedar wood, cypress wood is rot resistant and contains a natural deterrent (in this case a chemical, not oil) to insects and other critters. Characteristics like these make for a longer lifespan which, of course, is a great option for fencing material. However, because of the shipping and transportation costs of cypress wood, the cost is much higher than other options and should be considered when choosing your fencing material. Many opt to stain their cypress wood fence for a deeper, richer color. The longer you let your stain sit, the deeper the color will get. Once you’ve reached your desired color, add a couple layers of sealant to stretch the life of your fence even more. Redwood wood is considered by many to be the very best option when it comes to fencing material. In spite of its large price tag, it is used more than any other type of wood for fencing. It is beautiful, extremely durable, and is a good quality wood. Like the other woods mentioned today, redwood is resistant to rot and bugs, but should still be treated with a stain and sealant to boost the life of your fence. This also helps prevent the color fading to grey and any exposure to any elements. Because of its natural beauty, many people will choose a clear stain as to not change it. Whether you choose a wood fence, chain link, or even ornamental iron fencing, there are plenty of pros and cons to weigh when making your final decision. The same is true for vinyl fencing. When considering which fence type is best for you, you’ll have to consider what you want out of a fence and why it would or wouldn’t work best for your particular lifestyle. It is sometimes helpful to consider the reasons why a particular fence just wouldn’t work for you to help you eliminate some of the many options on the market. For example, what are four reasons to not choose vinyl fencing? Keep reading to find out. One of the first things customers want to know when shopping for a fence is how much it’s going to cost. It usually makes a huge difference when it comes to the type of fence you decide to put in your yard. One reason you may not want to choose vinyl is because of a higher cost. When compared to other fencing materials vinyl usually costs more upfront. If you’re not quite prepared financially for those extra costs, it could make vinyl a less than ideal choice. All fence types will have their “Achilles heel” when it comes to durability and strength, but vinyl may have weaknesses that are too hard to manage. Vinyl fences can turn brittle and crack easily under extreme temperatures, so if you life in a very cold or very hot place a vinyl fence may not be the best option for you. Most vinyl fences are solid, which make them great for lots of privacy. But with that privacy comes a lack of light and a restricted view. If you have lots of trees you may need that extra light in your backyard that would come easily through fences like chain link fence, for example. If you live in a beautiful area, you’d also be missing out on a pretty view! If you’re looking for a bright, clean, crisp fence vinyl may be a good choice… for a few years. But vinyl can be susceptible to algae buildup as well as mold and mildew. If these aren’t taken care of quickly and correctly, you’ll be left with unsightly stains. If these four reasons to not choose vinyl fencing apply to you, you should consider a different fencing material like wood, chain link, or iron. Need help getting started? 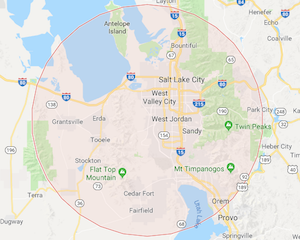 The experts at Outback Fencing have nearly 20 years of experience, and have been serving the people of Utah since 2003. They are licensed, bonded and insured; when you work with Outback Fencing you can expect honesty and integrity in every interaction. No matter what type of fence you’re looking for, the experts at Outback can help. And if these four reasons not to choose vinyl fencing make choosing a vinyl fence all the more attractive, Outback Fencing can help with that too. Don’t hesitate to contact them today! Will You Really Save Money Building Your Own Fence? “Do it yourself” options can be very enticing. With a little bit of extra work, you can save yourself bundles of money! You’ll learn a lot about your home and acquire new skills by taking care of projects yourself. But taking the place of a professional may not always be worth it. Unless you know what you’re doing, DIY projects can take a lot longer than you may have anticipated. If you make mistakes, the cost of your materials can quickly multiply. And then, you have to consider how much your time is worth. Some projects are worth doing yourself, and some are best left to professionals. But what about when it comes to the fencing around your home? Will you really save money building your own fence? Before you decide, you need to know what installing a fence actually entails. It’s not just as easy as sticking a few posts in the ground! If you choose to install a fence you’ll need to begin by doing some very accurate measuring and planning of your yard. This will help you determine the amount of materials you will need as well a how to place your posts and gate so that they look as even and symmetrical as possible. Before you even begin installing, you’ll need to know where all of your buried utilities are. The last thing you want to do is run into a pipe or cable as you’re trying to dig! It’s also going to save you some time and energy if you know your soil and are properly prepared. You should know if the soil in your yard is very rocky, or has lots of sand, because you’ll have to make adjustments accordingly. Once you’ve done you prep-work, you can begin digging your fence post holes. You can choose to do so by hand (which will be physically taxing) or rent a post hole auger. Renting tools is a great way to keep DIY costs low! You’ll need to make sure your fence posts are level and secure. This is where some cement and a trusty level come in handy! After that you’ll need to put the rails in squarely and securely. When you hire a professional, all that prep-work you would need to do yourself goes right out the window. Professionals are prepared to handle any situation that may arise while working on your fence. And chances are, throughout their years of experience, they’ve already met the unexpected challenge a time or two. And if for any reason there is a hitch they can’t handle, you can relax knowing it won’t be coming out of your pocketbook or personal time! DIY projects are a great way to get the job done exactly the way you want it. But when you work with the best of the best, you’ll get that kind of input without the hassle of DIY. When you choose Outback Fencing as your professional fence installer, you are choosing a company with more than 23 years of experience, who believe in an obligation to give you the best quality goods and services around. If you’re not ready to DIY your own fence, choose Outback Fencing! No two wood fences are the same, and when it comes to wood options, there are plenty to choose from. You could go with fir, pine, spruce, or even bamboo wood for your fence. These are all fine options, but you’re looking for the very best. Here’s why cedar wood is great for fences. One of the most sought-after qualities of a good fence is one that will stand the test of time. Pine, for example, is a softer wood that won’t be able to last as long as others. Cedar is a very durable wood which means it will hold up well under any kind of weather condition.You won’t have to worry about the wood bending or breaking. Cedar fences retain their shape so you won’t have to worry about readjusting posts or replacing them. Cedar has long been used as a source of perfume. The sticky oils in the wood actually act as a natural deterrent to insects. Without the threat of insect damage or rotting, this type of fencing has the ability to last a very long time. There’s no use trying to deny the beauty of a cedar fence. This type of wood will increase the curb appeal and value of your home. You can choose to leave the natural finish which is a gorgeous option. Over time it will face to a gray color, which is highly sought after by some. If you prefer, you can stain your wood fence any color you like to match your taste and the style of your home. While a cedar fence may cost a little more upfront in comparison to other types of fences, it is a beautiful option that will pay you back handsomely over time with very little upkeep and a gorgeous view. When you get your cedar wood fence from Outback Fencing, you’ll have plenty of options to choose from when it comes to fence styles. You can choose a short fence, or something very high for lots of privacy. You can choose a straight profile, convex, or concave top lines. You can have flat tops or the traditional picket fence; you can have vertical boards together or apart. You can also alternate side shadow box designs or post caps. Or why not add a wood lattice or wrought-iron view? The possibilities of a cedar wood fence are endless. And no matter what you choose, you’ll have a quality fence that will look beautiful for years to come. DIY is a great thing. You can usually save a few bucks and learn a new skill! But there are a few projects that should be done yourself very carefully. Your fence can make a huge difference when it comes to the value of your property. If you’re looking to sell your home, this will make a world of difference when it comes to the curb appeal of your home. That’s why when it comes to putting in a fence, you want to make absolutely sure it’s done correctly. Don’t miss out on opportunity or an easy increase in home value with these common DIY fence installation mistakes. Before you even begin planning what kind of fence you’ll have and how you will install it, you need to do a little bit of homework. First, you need to check with your city or county to make sure there are no zoning laws you should know about when it comes to your property and installing a fence. There may be boundary requirements or height limits, for example. You’ll also be able to find out if your fence should be on the property line, or how far inside the property line it needs to be. If you have an HOA, you need to check those requirements as well. While you’re at it, you need to make sure you know your property lines. If you don’t, you can hire a surveyor to come mark your property. It’s a small price to pay to make sure your fence is installed in the right place. A simple mistake of installing your fence a few inches one way or the other can lead to some serious litigation. Once you have the OK from your city and neighbors (if necessary) you can begin planning. This is another place where it’s easy to make mistakes. To install your fence correctly you need to take the time to make correct measurement, buy the proper material, and make sure everything is prepped and ready to go before you begin installation. One part of planning is to make sure you know where to put your post holes and any custom cuts in your fence that would throw off your pattern. It’s also important to know the grade of your yard and plan accordingly! If you don’t adjust the panels of your fence for an incline or decline, you’ll end up with an unsightly fence that could have large gaps! Another way to common mistake to make when you’re installing your own fence is improperly installing your posts. The longevity of your fence has a lot to do with how well your posts are installed. They need to be deep enough so that they stay anchored, with a layer of gravel or concrete to help. You also need to make sure the posts properly set before you even in stall your fence rails. DIY projects are great, but if you DIY a fence make sure you avoid common installation mistakes. If you’d rather avoid the risk, hire a professional like those with Outback Fencing to install your fence for you! Adding a fence to your property will not only keep your children and pets safely near home, but it will also boost the curb appeal, and add value to your home. However, when it comes time to install your fence, you may be worried about decreasing the size of your property slightly by losing space on the outskirts of your fence. You’ve probably asked yourself, “How close can I put a fence to my property line?” Here are a few pointers to help you answer that question! Before you determine just how close you can put a fence to your property line, you need to know exactly where your property line is! You may have a pretty good idea, but without having a survey done you won’t know for sure. Being off just an inch or two can really make a huge difference when it comes to adding a fence to your yard. The first step is to check with your assessor’s office to see if a survey has already been done (no need to do it twice!). If not, you’ll want to hire a professional surveyor to come assess the property. This is not considered the cheapest service, but in the long run it is worth it. Getting a survey can help you avoid some awkward and even legal conversations with neighbors, and having to move your fence once it’s been installed. Depending on where you live, your city or county regulations will have different requirements when it comes to building fences. They may even have a specific rule about where your fence needs to be in relation to your property line, which will make answering your question much easier. You may also find that you’ll have a few different options to choose from — right up to the property line, two, four, six, or eight inches from it. Regardless of where you choose to put your fence, make sure you are playing by the rules. If you live somewhere with an HOA, you’ll want to check their regulations as well. If your fence is going to be very close to the property line, or you want it to sit on the property line, it’s a good idea to be cooperative and talk with your neighbors first. If the fence is on the property line, you may be able to split responsibility and costs. If they have an existing fence, you may want to consider asking your neighbor if you can tie into it rather than having two fences right on top of each other, or dead space between them. Whatever kind of fence and spacing you choose, open communication and cooperation will make for happy neighborhood relationships for years to come. Once you’ve decided how close you can put a fence to your property line, it’s time to get it installed! Whether you’re looking for a wood, vinyl, ornamental iron, or chain link fence, let Outback Fencing be the contractor to make your fencing dreams a reality.